Good Souls; The Official Starsailor Archive of fan materials. Personal photographs and band diary entries. The Good Souls Starsailor Fan Archive is an area of Starsailor's official web site at www.starsailor.net and has been set up in order to make fan photographs, live gig reviews and the like, available for other fans to enjoy. The archive of events now covered is extensive, please see the Site Map for a complete listing. This site isn't intended to be used to find out about the latest Starsailor news, so please see http://www.starsailor.net for further information on forthcoming tours, releases etc. and visit the message board where all the latest developments are discussed. I have also added a Starsailor FAQ here of the most commonly asked questions I receive by e-mail. Copyright on all of the information contained on this site belongs to the person stated on each page or adjacent to photographs and you are asked not to use these photos or to reproduce them elsewhere, in any way, without the express permission of the copyright owner and an e-mail link will be provided so that you can contact them. I would ask however that if you want to make your photographs here available to other people, that you do not link to the images hosted here, directly from other web sites or message boards, but please supply the URL to visit here instead. This site does not have the capacity to serve files to third party web pages. The URL is http://www.goodsouls.org.uk/ or the site can be accessed through http://www.starsailor.net. 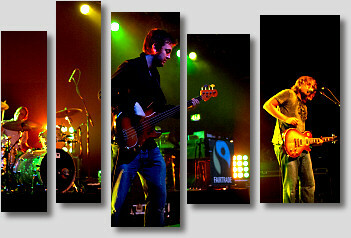 How can I show my material in the Good Souls; Official Starsailor Fan Archive? For the time being, no new material can be added to the site as Starsailor are taking some time off band activities to work on individual projects. Please see this message board announcement I made for further details. I will maintain the site as it is now, for as long as I can, but my contract to Starsailor has now ended and so this will remain very much a personal commitment. Many thanks for your support over the last 9 years and for sharing your band experiences here. Official photographs and the Starsailor logo are copyright to EMI:Virgin Records and are reproduced with their permission. © on the Good Souls Starsailor Archive site as a collection belongs to 'Boo. 2002 to 2009. All rights reserved.